One of the notable HR trends will be the evolution of traditional performance management from mid and or, year-end performance appraisal reviews to real-time, regular and consistent performance conversations. Ongoing performance coaching, career coaching and feedback sessions between superiors and their reporting staff will be part of supervision. The multi-generation workforce in the organisation, especially the millennials also favour regular coaching and feedback as there is mutual understanding, listening and communication to enable them to perform and develop further. People Management is not the sole responsibility of HR function but an indispensable function of every Leader and Manager to lead, manage, develop and inspire their people to grow and glow. Instead of instructing, checking and controlling, it is critical for Leaders and Managers to adopt coaching, stay interview and feedback as a leadership style. Through coaching and stay interview, leaders can bring out the best of their people, develop and stretch their potential to reach organisation’s goals, and achieve business and performance outcomes. Leaders who coach and provide regular feedback to their staff will lead to an interactive and positive working relationship. They can also jointly identify issues, set mutually agreed performance goals and outcomes, discover the strengths and areas for improvement, co-create action plans and commit to fulfil their actions. As coaching, feedback and career conversations are the key competencies of an Effective Leader/Manager, what is the mindset of your Leaders and Managers with regards to conduct coaching and feedback regularly? How well-equipped are they in conducting effective coaching sessions, stay interviews and constructive feedback that motivate and not demotivate their people? What needs to be done for HR to initiate, implement and sustain an effective coaching and feedback system and culture in the organisation? • Identify the purpose and benefits of providing performance coaching and feedback. • Acquire a positive mindset and essential skills for effective coaching and feedback. • Apply Coaching framework in various coaching situations with your subordinates. • Use coaching for performance, career conversations, career development and “stay” interview. • Provide positive and constructive feedback that is fruitful and motivating for the staff. • Identify the process initiating, implementing and sustaining an effective coaching and feedback culture in the organisation. • Discuss the upcoming trends in Performance Management and Performance Appraisal review, implications and changes needed for the organisation, HR, leaders and employees. • Debunk the common myths of coaching- what is coaching and what is not coaching. • Identify the purpose and benefits of coaching to be an effective leader and manager. • Understand the role of a Leader in providing real-time, regular and consistent Performance Coaching and feedback. • Understand the concept and importance of “Career conversations” and “Stay interview”. • Discover ways to inculcate a positive mindset amongst the supervisors when coaching and giving feedback. • State and practice the type of coaching questions, how and when to use these questions. • Apply key listening skills in coaching sessions. • Discover the coaching questions at each stage of the coaching framework. • Identify ways to manage challenging coachees, negative and under performing staff. • Identify ways to motivate coachees who have the potential to do well or assume higher responsibilities. • Conduct coaching sessions based on real life working situations of various staff personalities/workplace challenges. • Overcome the challenges in giving negative feedback. • Able to provide positive and fruitful feedback that enhances work performance and motivation. • Overcome coachees who are reluctant to receive feedback. • Identify ways to provide positive and constructive feedback to your staff. • Identify the phases of initiating, implementing and sustaining an effective coaching and feedback culture. • Overcome the challenges in each of the phases. • Manage and prepare the various stakeholders in the organisation for regular coaching and feedback. • Implement effective change management to overcome transition and resistance towards change. Jasmine Liew has 16 years of Human Resource experience specializing in Human Resource Development, Organisation Development, Change Management, Leadership-Management Training, Process Facilitation, Performance and Career Coaching. Her span of experience ranges from the Civil Service - Singapore Land Authority, International Enterprise Singapore, National Healthcare Group, MNCs-Panasonic and Dairy Farm South Asia and the Private Sector - Certis CISCO and PSA. She was the former Head of Organization Development for PSA and also, oversees the Learning and Development departments of organisations that she worked with previously. Jasmine is currently an Organisation Learning & Development Consultant that specializes in change management, employee engagement, appreciation at work, high performing team, performance and career coaching, emotional intelligence and process facilitation. In PSA and Certis CISCO, Jasmine had initiated a Coaching Culture, designed and conducted customized Coaching Programs for leaders and managers to effectively coach and provide useful feedback at work. She had coached Leaders, Manager, Professionals and High Potentials to stretch their abilities and potential to be an effective Leader and Manager and thus, achieve greater work performance. More than 3,000 regional participants, including C-Suite and Department Heads have attended the training programs conducted by Jasmine for the past 9 years. 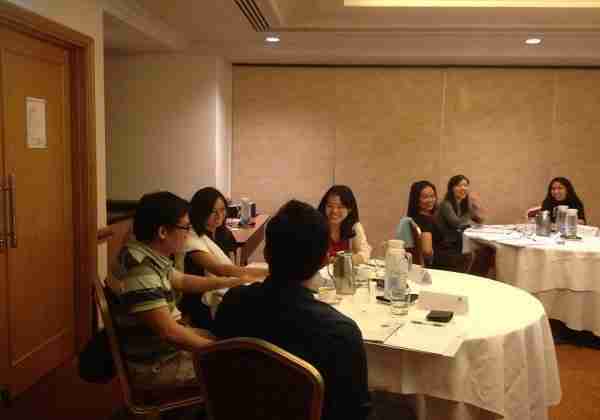 Beyond Singapore, Jasmine has conducted training in Indonesia, Malaysia, Thailand, Philippines, Vietnam, and India. Jasmine holds a Masters in Education & HRD at the George Washington University USA and a Bachelor of Arts from The National University of Singapore.